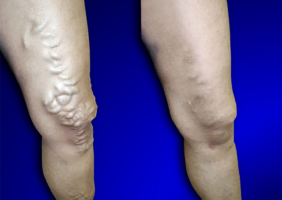 Varicose veins are enlarged veins that can appear as blue, red or flesh colored. They are often on the legs, raised above the skin and look like twisted bulging cords. At The Secret Vein Clinic we offer premier varicose vein treatment in San Diego. Varicose veins are primarily caused by faulty valves in the superficial veins located in the lower extremities. When these valves fail to function properly the blood flow moves in the opposite direction increasing the blood flow on the surface veins near the skin. These surface veins cannot compensate for this increase in volume causing the veins to bulge and twist like a knotted rope, often appearing dark purple or blue. 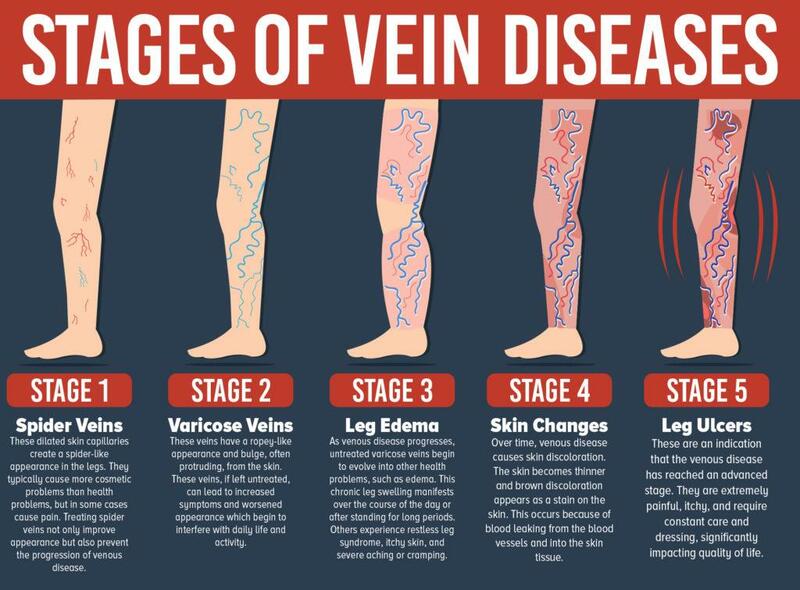 If you are experiencing any of these symptoms visit us for varicose vein treatment in San Diego. We are the #1 clinic for varicose vein treatment! At The Secret Vein Clinic, Varicose veins are diagnosed by a thorough physical examination, accompanied by a non-invasive ultrasound test to determine the location of the abnormal valve or valves within the veins through our vascular lab. 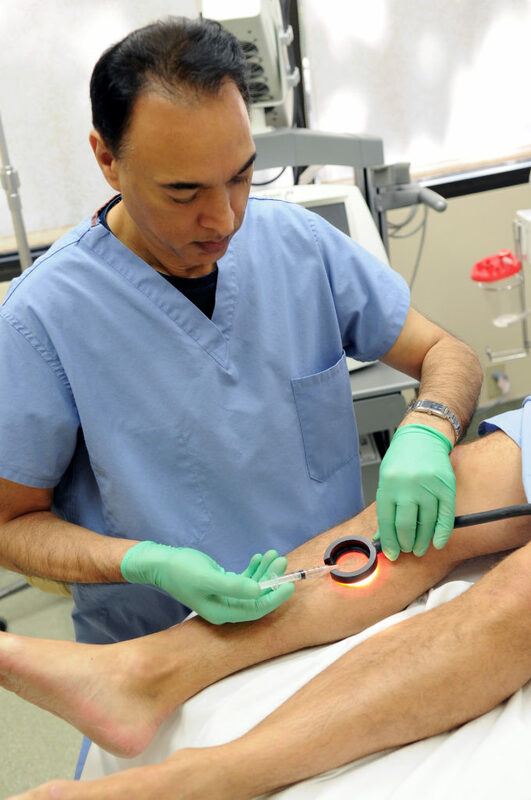 Options for vein treatment include microsurgery to remove the Varicose veins, as well as non-invasive procedures to close the underlying abnormal Saphenous veins. Book your 100% FREE consultation with Dr. Mann! Many people believe that varicose veins are simply a cosmetic issue. In fact, most people do not start seeking treatment until painful symptoms begin to arise. If you suffer from varicose veins, you know how painful these diseased veins can become. You may suffer from leg heaviness and fatigue, leg pain, restless legs, swollen leg limbs, skin changes, and night cramps and ulcers. These symptoms start slowly and will worsen if the varicose veins are not healed, making it very important to seek early treatment. Even if you think the veins are just unsightly, there are serious, underlying medical factors at play. What you cannot see, is that varicose veins are the result of damaged vein valves. When these vein valves do not close properly, the blood flow process in the legs is disrupted. The only way to diagnose this condition is to visit your vascular surgeon for an ultrasound exam and consultation. During this exam, the vascular surgeon can use the ultrasound to look at your internal blood flow and vein function in your legs. If varicose veins are left untreated for a prolonged period of time, very serious and issues can arise including: hyperpigmentation, lipodermosclerosis, venous leg ulcers, spontaneous bleeding, superficial thrombophlebitis, and a potentially life-threatening condition called deep vein thrombosis. There are several adverse consequences of leaving varicose veins untreated and they will vary from patient to patient. The most common symptoms including pain, fatigue and swelling of the legs or ankles are universal. However, more advanced medical problems do arise often, and are described below. When varicose veins are left untreated, excess blood from the damaged vein valves begins to leak into the tissues of the leg. The patient will experience painful swelling and inflammation as parts of their skin become dark and discolored. During the advanced stages of venous disease, hyperpigmentation can become extremely severe and affect daily activities. When tissues of the leg become inflamed due to the advanced stage of the venous disease, the tissues become very firm and heavy. When this happens, the patient will feel their legs becoming increasingly tender, taut, hard and very sensitive to the touch. Lipodermatoclerosis is the medical term used to define this stiffening or hardening of the leg tissues. Varicose veins that are left untreated usually result in a condition known as chronic venous insufficiency or CVI. Over time, CVI can result in venous leg ulcers. This is a serious condition where an area of the skin breaks down to reveal the flesh underneath. Leg ulcers are open wounds and do not heal by themselves. In fact, the leg ulcers tend to get larger over time and severely affect daily activities. Leg ulcers are in no way to be taken lightly, and it is important to seek professional medical intervention by a vascular surgeon. Because the diseased varicose veins lie very close to the surface of the skin, bleeding can happen quite easily. Scraping your leg or coming in contact with something abrasive can cause a serious cut and bleeding. While the bleeding is usually painless, patients may experience significant blood loss if the condition goes untreated. Should this happen, apply pressure to the wound and get medical attention as quickly as you can from your vascular surgeon. Superficial thrombophlebitis is an inflammation of the veins themselves, just beneath the surface of the skin. This inflammation is due to the damaged vein valves, decreased blood flow through the veins and blood clotting. The patient will experience redness of the skin, an increasing tenderness of the vein and ongoing pain or swelling of the legs. DVT is the most serious condition and it is life-threatening. This is when a blood clot forms in the thigh or lower leg causing serious blocking of the veins and arteries. It is very painful and must be treated immediately! If untreated, the clot could reach your lungs which will lead to death. People who have experienced this condition have reported a pulling sensation on the leg or calf muscles. The patient may feel as if their nerves are being pinched. Other signs include a warm sensation, swelling, and redness. If you experience these symptoms, it’s imperative to visit your vascular surgeon immediately. Blood clots also can form within these veins due to slow or stagnant blood flow, ultimately leading to Phlebitis. When phlebitis develops, the area around the clot may become painful, hot, red and swollen. Long term untreated Varicose veins can cause ulcers and poor healing of wounds. Ensuring treatment prior to the development of phlebitis will help the patient avoid unnecessary pain as well as the risk of additional complications. Thanks to ongoing advances in medical treatment and Dr. Mann’s dedication to staying on the cutting edge of technology, our varicose vein treatment is performed using minimally invasive procedures, without the potential complications of general anesthesia. In many cases, the incisions are smaller than 3-4mm, recovery times are short, and results are long-term. Ultrasound testing is the cornerstone of diagnosis for vascular conditions. On visiting the Secret Vein Clinic for a consultation, your evaluation will include a comprehensive venous work up with advanced diagnostic studies. The duplex ultrasound exam will identify the veins with faulty valves responsible for venous reflux. When completed, you will know the underlying cause of your venous condition and how we can correct it. We are providers for Medicare, Tri Care and most PPO insurances, including Blue Cross, Blue Shield, Aetna, Cigna, and United Health Care.